Being a good DJ is not easy. It requires talent, dedication and practice. The good news is, you can be a bad DJ and get almost as much tail. As a culture, we seem to blindly worship the one who controls the party. This is why you should insist on being placed on some kind of raised platform or pedestal. If you don’t know what you’re doing, at least look busy. Wear a hat or a hood, something you can pull down over your eyes. This will make you seem that much more mysterious. Hunch your shoulders and bend your neck. The measure of a DJ’s greatness is based on how low they stoop down towards their decks. 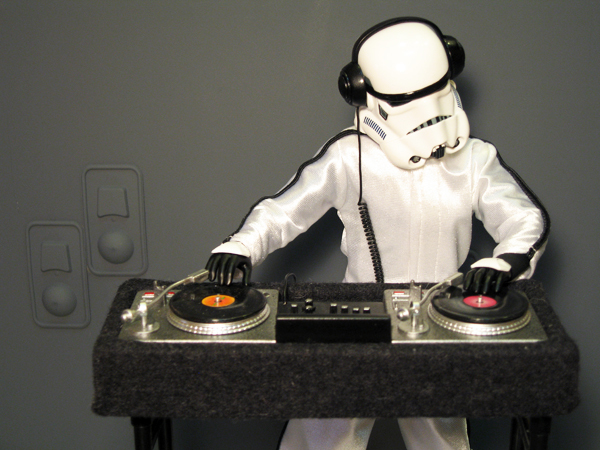 Even if you’re just playing tracks off your ipod, the DJ is given a special position of respect. If the kids are digging your tunes, you’re golden. Let them all dance in your glow, baby. This entry was posted on October 5, 2009 at 10:44 am and is filed under soirees. You can follow any responses to this entry through the RSS 2.0 feed. You can leave a response, or trackback from your own site. fin ya me encuentro con contenido en condiciones. La mejor parte es el gran detalle del texto. Lo cierto es que las apps móviles tienen un potencial enorme y algunas son impresionantes.